Please be sure you have checked the errata (click on the ravelry link for latest version, the Vogue page will be updated shortly). 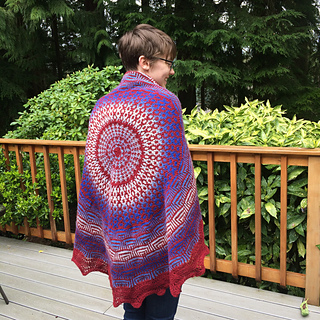 If the wow factor is what you’re after, we recommend this stunning circular wrap, worked in the round from the center out in four colors of Plymouth Yarns’ DK Merino Superwash. 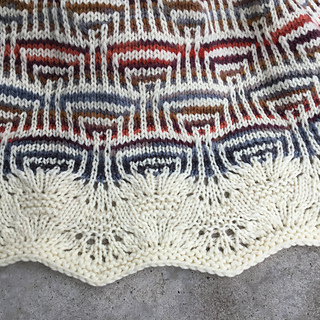 Ashcroft used a light gray background worked in two different stockinette mosaic patterns with contrasting stripes. Encompassing the piece is a lacy scalloped edge.